No, it isn’t the second coming, but it is pretty cool. Alfredo Lo Brutto, an Italian artist, was enjoying the sunset at his home by the Mediterranean when he noticed an unusual cloud formation in the sky. “I was enchanted by the view…I wanted other people to see because it was so beautiful,” Lo Brutto said. 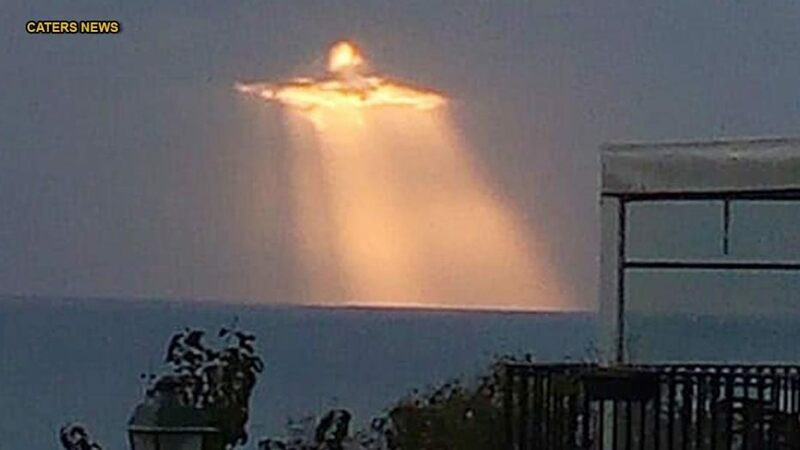 The photo shows a break in the clouds that when pierced by the light resembles the renown statue “The Redeemer” in Rio de Janeiro, Brazil. Social media is abuzz with reaction as many say they can see the outline of Jesus in the sky: his arms stretched out as if blessing the earth. Sunbeams streaming through the clouds, the full figure of a man in robes is clear to some. The resemblance to the Brazilian statue is uncanny. The statue is nearly 120 feet tall and is the tallest ever made of the Christ. According to the “Info Cilento” in Italy, this image was taken from Piazza Sanseverino. This is not the first occurrence of people seeing things in the clouds. A favorite pass time of young children is to watch the clouds as they pass and call out what we see in the shapes. The human eye and imagination view and categorize images all the time, but cloud formations take more imagination than some. Likewise, people have seen the image of Christ on everything from the back of crabs to burnt cheese sandwiches. This picture is a gentle reminder that one day we will see Jesus in the clouds, and it will not be a trick of the light or a cloud formation, but the King of kings himself.